During the medieval period, cathedrals were designed as centers of light in a dark world. By the 17th century they had evolved to not just to the edification of God, but by their very structure, monuments of art, architecture, engineering and science. A rather literal attempt to reach for something higher, beyond the bonds of this earth. 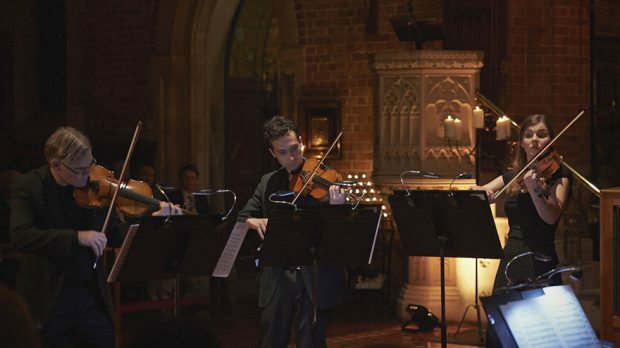 As such St George’s Cathedral (despite being of a much more recent vintage) makes the perfect backdrop for this 5th year of Baroque By Candlelight, as the music of the Perth Chamber Orchestra captures those composers that attempted to evoke that sense of the divine in their work. Bathed in candlelight audiences were transported back to the era, but the PCO had some much more modern tricks up their sleeves when it came to staging, as they would demonstrate throughout the night: lighting up the space with projections and transfiguring stone and brick archways into works of stained glass. The pearls chosen for the orchestra’s selection highlighted the masters of the 18th century, catering not just to the perennial favourites like Bach and Handel, but also showcasing lesser known composers, such as Neruda. As such their repertoire re-invigorated the familiar. 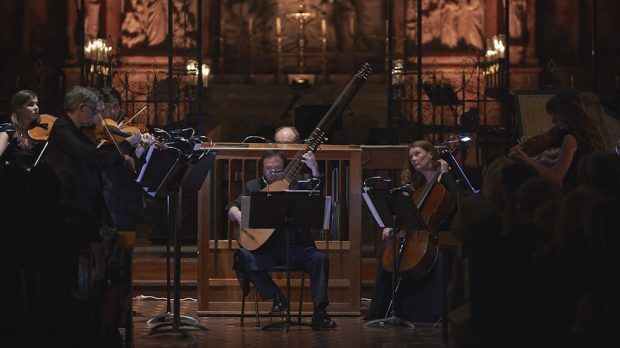 They showed us new, and some rather old ways (through focusing on instruments such as the harpsichord and theorbo), of exploring the compositions. Here the Perth Chamber Orchestra was often stepped into the background, allowing some of the soloists to shine. 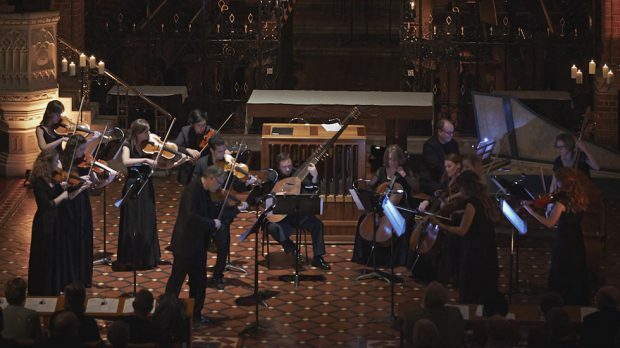 From the eerily strange sounds of Bach’s Partita No3 in E Major being played on a banjo by the young Joshua Crestwell, to the clarion voice of Prudence Sanders standing as Handel’s seraphim made manifest, theirs was the moments that often stole the show. Yet the Perth Chamber Orchestra were not pushed into the background, rather they allowed others to share the stage. In works such as Bach’s Violin Concerto, Paul Wright led the orchestra in a gleeful form, attacking the classic with controlled gusto. However it was during a nonet of Mustonen that the PCO demonstrated its full potential. Here was a work radically different than what had preceded, yet entirely in keeping with the theme (despite the composer writing centuries afterwards). Sometimes jagged and bordering on atonal, other times harmonious but tinged with a brittle beauty, this was a piece that teeters on collapsing into disharmony, but is so carefully constructed underneath as to be a revelatory. Here the orchestra showed its consummate skills, providing a wonderful conclusion to the night’s fare. The result is an event evocative of the era, the surroundings transporting audiences back by the flickering glow of the candles. At times you could close your eyes and almost smell the wig powder, and hear the ruffle of frilled sleeves. Then you would be shocked back into the modern world, confronted by the 50 foot shadow of a soprano projected against the rear wall of the chancel. A fantastic blend of old and new, and a fitting way to end the Heritage series for the year.